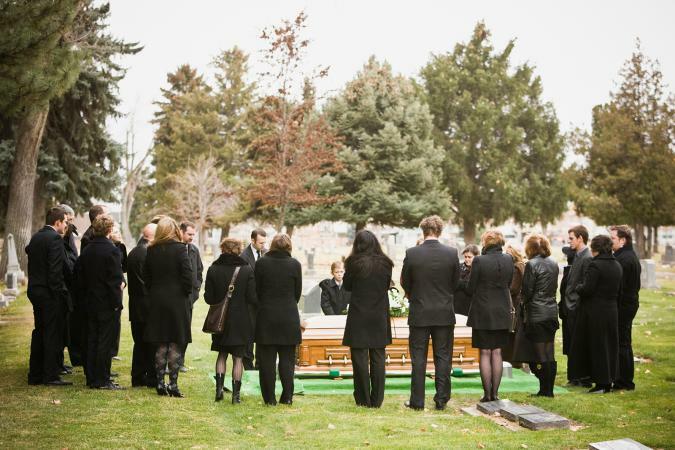 A memorial tribute to a mom who passed away is also commonly referred to as a eulogy. This is a speech that someone close to the deceased gives at the funeral as a final tribute. Writing memorial tributes to deceased mothers can be difficult and emotional. 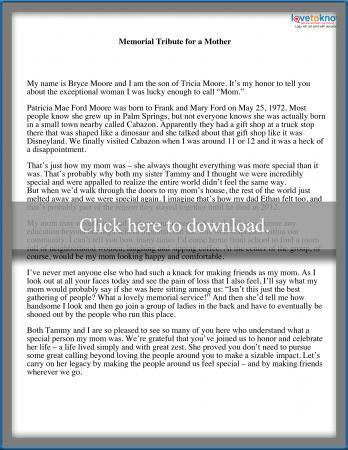 Use the memorial tribute sample provided to help you get started. The responsibility of giving the memorial tribute typically falls on the eldest child of the deceased, but this is not an absolute rule. It's important that the person giving the memorial tribute is not only willing to do so but has the ability to do so as well. In other words, a hysterical eldest child who may have a difficult time getting any words out at the podium might allow an adult grandchild who has a better ability to speak calmly in front of people to deliver the tribute. The purpose of the memorial tribute is to give those in attendance a feel for the life of the deceased. It's a way to share favorite memories and paint the deceased in a good light. While writing the tribute, keep in mind that being a mother was likely the most important role in the deceased's life. Highlight the role of motherhood in the memorial tribute, emphasizing how much the deceased loved and cared for her children, grandchildren, great-grandchildren, etc. Important dates such as a wedding date, graduation date, etc. While writing the memorial tribute, think about what the deceased would have wanted said about her, and let that be your guide. While your mother will undoubtedly have experienced a much different life than the moms featured in these sample tributes, use the samples as guides to writing your own. Notice how both samples exalt the mothers' role as mothers while also mentioning other aspects of their lives. If you need help to download the printable, check out these helpful tips. The mom's life in this sample tribute was characterized by a great love for animals and a fearlessness later in life. This tribute is written about a mom who enjoyed socializing with other people so much that it became one of her identifying traits in life. It may be too painful for some people to read aloud a highly personalized tribute about their mother at her funeral. In these instances, a funeral poem specifically for moms or a song might be a good option. This allows you to use someone else's well-crafted words to honor your mother. If getting up in front of people to speak makes you nervous, keep in mind that nobody expects perfection in your words or delivery. Those in attendance understand that this is a difficult time. Prepare as much as you can beforehand so that when the time comes to get up and deliver the eulogy it can be a fitting and memorable tribute to a special woman.